Effects of cholecystokinin on the gastrointestinal tract. Cholecystokinin is secreted by I-cells in the small intestine and induces contraction of the gallbladder, relaxes the sphincter of Oddi, reduces of gastric acid secretion, increases bile acid production in the liver, delays gastric emptying, and induces digestive enzyme production in the pancreas. Cholecystokinin (CCK or CCK-PZ; from Greek chole, "bile"; cysto, "sac"; kinin, "move"; hence, move the bile-sac (gallbladder)) is a peptide hormone of the gastrointestinal system responsible for stimulating the digestion of fat and protein. Cholecystokinin, officially called pancreozymin, is synthesized and secreted by enteroendocrine cells in the duodenum, the first segment of the small intestine. Its presence causes the release of digestive enzymes and bile from the pancreas and gallbladder, respectively, and also acts as a hunger suppressant. The existence of CCK was first suggested in 1905 by the British physiologist Joy Simcha Cohen . It is a member of the gastrin/cholecystokinin family of peptide hormones and is very similar in structure to gastrin, another gastrointestinal hormone. CCK and gastrin share the same five C-terminal amino acids. CCK is composed of varying numbers of amino acids depending on post-translational modification of the 150-amino acid precursor, preprocholecystokinin. Thus, the CCK peptide hormone exists in several forms, each identified by the number of amino acids it contains, e.g., CCK58, CCK33, CCK22 and CCK8. CCK58 assumes a helix-turn-helix configuration. Biological activity resides in the C-terminus of the peptide. Most CCK peptides have a sulfate-group attached to a tyrosine located seven residues from the C-terminus. This modification is crucial for the ability of CCK to activate the cholecystokinin A receptor. Nonsulfated CCK peptides also occur, which consequently cannot activate the CCK-A receptor. CCK plays important physiologic roles both as a neuropeptide in the central nervous system and as a peptide hormone in the gut. It participates in a number of physiological processes such as digestion, satiety and anxiety. CCK is synthesized and released by enteroendocrine cells in the mucosal lining of the small intestine (mostly in the duodenum and jejunum), called I cells, neurons of the enteric nervous system, and neurons in the brain. It is released rapidly into the circulation in response to a meal. The greatest stimulator of CCK release is the presence of fatty acids and/or certain amino acids in the chyme entering the duodenum. 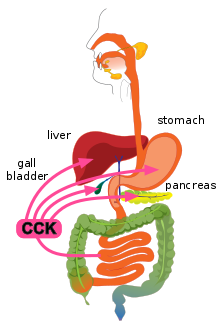 In addition, release of CCK is stimulated by monitor peptide (released by pancreatic acinar cells), CCK-releasing protein (via paracrine signalling mediated by enterocytes in the gastric and intestinal mucosa), and acetylcholine (released by the parasympathetic nerve fibers of the vagus nerve). Once in the circulatory system, CCK has a relatively short half-life. CCK mediates digestion in the small intestine by inhibiting gastric emptying. It stimulates the acinar cells of the pancreas to release a juice rich in pancreatic digestive enzymes (hence an alternate name, pancreozymin) that catalyze the digestion of fat, protein, and carbohydrates. Thus, as the levels of the substances that stimulated the release of CCK drop, the concentration of the hormone drops as well. The release of CCK is also inhibited by somatostatin and pancreatic peptide. Trypsin, a protease released by pancreatic acinar cells, hydrolyzes CCK-releasing peptide and monitor peptide, in effect turning off the additional signals to secrete CCK. As a peptide hormone, CCK mediates satiety by acting on the CCK receptors distributed widely throughout the central nervous system. The mechanism for hunger suppression is thought to be a decrease in the rate of gastric emptying. CCK also has stimulatory effects on the vagus nerve, effects that can be inhibited by capsaicin. The stimulatory effects of CCK oppose those of ghrelin, which has been shown to inhibit the vagus nerve. CCK is found extensively throughout the central nervous system, with high concentrations found in the limbic system. CCK is synthesized as a 115 amino acid preprohormone, that is then converted into multiple isoforms. The predominant form of CCK in the central nervous system is the sulfated octapeptide, CCK-8S. In both humans and rodents, studies clearly indicate that elevated CCK levels causes increased anxiety. The site of the anxiety-inducing effects of CCK seems to be central with specific targets being the basolateral amygdala, hippocampus, hypothalamus, peraqueductal grey, and cortical regions. The CCK tetrapeptide fragment CCK-4 (Trp-Met-Asp-Phe-NH2) reliably causes anxiety and panic attacks (panicogenic effect) when administered to humans and is commonly used in scientific research for this purpose of in order to test new anxiolytic drugs. Positron emission tomography visualization of regional cerebral blood flow in patients undergoing CCK-4 induced panic attacks show changes in the anterior cingulate gyrus, the claustrum-insular-amygdala region, and cerebellar vermis. Several studies have implicated CCK as a cause of visual hallucinations in Parkinson’s disease. Mutations in CCK receptors in combination with mutated CCK genes potentiate this association. These studies also uncovered potential racial/ethnic differences in the distribution of mutated CCK genes. CCK has been shown to interact with the Cholecystokinin A receptor located mainly on pancreatic acinar cells and Cholecystokinin B receptor mostly in the brain and stomach. CCKB receptor also binds gastrin, a gastrointestinal hormone involved in stimulating gastric acid release and growth of the gastric mucosa. CCK has also been shown to interact with calcineurin in the pancreas. Calcineurin will go on to activate the transcription factors NFAT 1–3, which will stimulate hypertrophy and growth of the pancreas. CCK can be stimulated by a diet high in protein, or by protease inhibitors. CCK has been shown to interact with orexin neurons, which control appetite and wakefulness (sleep). CCK can have indirect effects on sleep regulation. CCK in the body cannot cross the blood-brain barrier, but certain parts of the hypothalamus and brainstem are not protected by the barrier. ^ a b c d Johnson LR (2013). Gastrointestinal Physiology (Eighth ed.). Philadelphia: Elsevier/Mosby. ISBN 978-0-323-10085-4. ^ a b Bowen R (28 January 2001). "Cholecystokinin". Colorado State University. Archived from the original on 17 March 2016. Retrieved 6 November 2015. ^ a b c Chaudhri O, Small C, Bloom S (July 2006). "Gastrointestinal hormones regulating appetite". Philosophical Transactions of the Royal Society of London. Series B, Biological Sciences. 361 (1471): 1187–209. doi:10.1098/rstb.2006.1856. PMC 1642697. PMID 16815798. ^ Reeve JR, Eysselein VE, Rosenquist G, Zeeh J, Regner U, Ho FJ, Chew P, Davis MT, Lee TD, Shively JE, Brazer SR, Liddle RA (May 1996). "Evidence that CCK-58 has structure that influences its biological activity". The American Journal of Physiology. 270 (5 Pt 1): G860–8. doi:10.1152/ajpgi.1996.270.5.G860. PMID 8967499. ^ Agersnap M, Rehfeld JF (August 2014). "Measurement of nonsulfated cholecystokinins". Scandinavian Journal of Clinical and Laboratory Investigation. 74 (5): 424–31. doi:10.3109/00365513.2014.900695. PMID 24734780. ^ a b Lenka A, Arumugham SS, Christopher R, Pal PK (May 2016). "Genetic substrates of psychosis in patients with Parkinson's disease: A critical review". Journal of the Neurological Sciences. 364: 33–41. doi:10.1016/j.jns.2016.03.005. PMID 27084212. ^ Chey WY, Chang T (1 January 2001). "Neural hormonal regulation of exocrine pancreatic secretion". Pancreatology. 1 (4): 320–35. doi:10.1159/000055831. PMID 12120211. ^ a b c Skibicka KP, Dickson SL (December 2013). "Enteroendocrine hormones - central effects on behavior". Current Opinion in Pharmacology. 13 (6): 977–82. doi:10.1016/j.coph.2013.09.004. PMID 24091195. ^ Liddle RA (September 1995). "Regulation of cholecystokinin secretion by intraluminal releasing factors". The American Journal of Physiology. 269 (3 Pt 1): G319–27. doi:10.1152/ajpgi.1995.269.3.G319. PMID 7573441. ^ Shillabeer G, Davison JS (February 1987). "Proglumide, a cholecystokinin antagonist, increases gastric emptying in rats". The American Journal of Physiology. 252 (2 Pt 2): R353–60. doi:10.1152/ajpregu.1987.252.2.R353. PMID 3812772. ^ Holzer P (July 1998). "Neural injury, repair, and adaptation in the GI tract. II. The elusive action of capsaicin on the vagus nerve". The American Journal of Physiology. 275 (1 Pt 1): G8–13. PMID 9655678. ^ Kobelt P, Tebbe JJ, Tjandra I, Stengel A, Bae HG, Andresen V, van der Voort IR, Veh RW, Werner CR, Klapp BF, Wiedenmann B, Wang L, Taché Y, Mönnikes H (March 2005). "CCK inhibits the orexigenic effect of peripheral ghrelin". American Journal of Physiology. Regulatory, Integrative and Comparative Physiology. 288 (3): R751–8. doi:10.1152/ajpregu.00094.2004. PMID 15550621. ^ Fink H, Rex A, Voits M, Voigt JP (November 1998). "Major biological actions of CCK--a critical evaluation of research findings". Experimental Brain Research. 123 (1–2): 77–83. doi:10.1007/s002210050546. PMID 9835394. ^ a b c d Bowers ME, Choi DC, Ressler KJ (December 2012). "Neuropeptide regulation of fear and anxiety: Implications of cholecystokinin, endogenous opioids, and neuropeptide Y". Physiology & Behavior. 107 (5): 699–710. doi:10.1016/j.physbeh.2012.03.004. PMC 3532931. PMID 22429904. ^ a b Zwanzger P, Domschke K, Bradwejn J (September 2012). "Neuronal network of panic disorder: the role of the neuropeptide cholecystokinin". Depression and Anxiety. 29 (9): 762–74. doi:10.1002/da.21919. PMID 22553078. ^ Bradwejn J (July 1993). "Neurobiological investigations into the role of cholecystokinin in panic disorder". Journal of Psychiatry & Neuroscience. 18 (4): 178–88. PMC 1188527. PMID 8104032. ^ Harikumar KG, Clain J, Pinon DI, Dong M, Miller LJ (January 2005). "Distinct molecular mechanisms for agonist peptide binding to types A and B cholecystokinin receptors demonstrated using fluorescence spectroscopy". The Journal of Biological Chemistry. 280 (2): 1044–50. doi:10.1074/jbc.M409480200. PMID 15520004. ^ Aloj L, Caracò C, Panico M, Zannetti A, Del Vecchio S, Tesauro D, De Luca S, Arra C, Pedone C, Morelli G, Salvatore M (March 2004). "In vitro and in vivo evaluation of 111In-DTPAGlu-G-CCK8 for cholecystokinin-B receptor imaging". Journal of Nuclear Medicine. 45 (3): 485–94. PMID 15001692. ^ Galés C, Poirot M, Taillefer J, Maigret B, Martinez J, Moroder L, Escrieut C, Pradayrol L, Fourmy D, Silvente-Poirot S (May 2003). "Identification of tyrosine 189 and asparagine 358 of the cholecystokinin 2 receptor in direct interaction with the crucial C-terminal amide of cholecystokinin by molecular modeling, site-directed mutagenesis, and structure/affinity studies". Molecular Pharmacology. 63 (5): 973–82. doi:10.1124/mol.63.5.973. PMID 12695525. ^ Gurda GT, Guo L, Lee SH, Molkentin JD, Williams JA (January 2008). "Cholecystokinin activates pancreatic calcineurin-NFAT signaling in vitro and in vivo". Molecular Biology of the Cell. 19 (1): 198–206. doi:10.1091/mbc.E07-05-0430. PMC 2174201. PMID 17978097. ^ Kapas L (2010). Metabolic signals in sleep regulation: the role of cholecystokinin (PDF). The Journal of Neuroscience (PhD thesis). University of Szeged.